Sometimes an item appears on ebay that makes you think "why?" Here's an auction for such an item. It's a external Dreamcast cooling fan that comes complete with it's own power cord. And there's me thinking just the one fan was sufficient. Oh, and if the auction ends before you can piss your money away on such a pointless artifact, you can buy one here. Maybe this cooler is more silent than (or better: is silent in opposite to xD) the original cooler and you can throw the original one away if you use this one? From what I can gather, this thing fits on the back of the console and whirrs away sucking more heat out of the case. 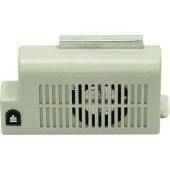 It's not really to be used instead of the internal fan, rather it is an additional one. Unless you're playing your Dreamcast inside the crater of an active volcano though, I can't really see the need. Probably the same thing with everyone else too, right? Rush Rush Rally Racing Trailer! Happy 10th Anniversary of 9.9.99!